Imagine using a robotic arm to grip and puncture the trunk of a citrus tree to deliver chemicals into the vascular parts of the plant, reducing its susceptibility to the citrus greening disease. 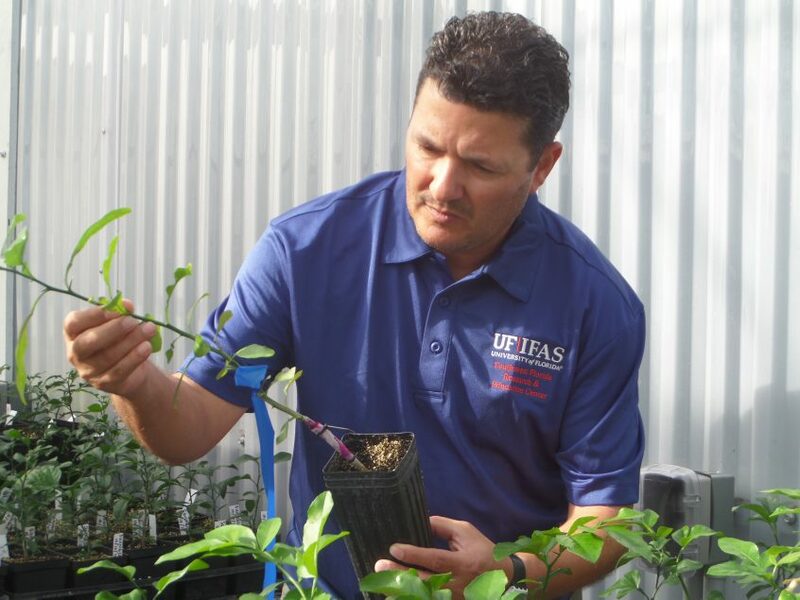 Ozgur Batuman, an assistant professor of plant pathology at the University of Florida Institute of Food and Agricultural Sciences (UF/IFAS), leads a team of researchers trying to make the automated delivery system a reality to help growers deal with the disease. Greening has led to huge losses for Florida’s multibillion-dollar-a-year citrus industry. “The automated delivery system can be installed on any farm equipment and be operated by anyone who is driving — physically or remotely,” Batuman said. The person will be trained to use a joystick to control the arm that delivers the chemicals, he said. To conduct the research, scientists will use a $3.4 million grant from the National Institute of Food and Agriculture, an arm of the U.S. Department of Agriculture. The system would extend from a tractor or ATV to grab the tree trunk. Because the grip has many small needles, it can create numerous tiny openings in the tree, said Batuman, a faculty member at the UF/IFAS Southwest Florida Research and Education Center in Immokalee, Florida. Bactericides can enter the tree through those small openings, he said. These areas on the trunk with openings will be covered with a reservoir, such as a funnel or plastic balloon, that will hold the liquid containing the bactericide, Batuman said. The liquid then slowly enters through the holes of the trunk. This contrasts with traditional tree trunk injections, in which a grower would use large, single-needle syringes to inject liquid materials in one spot, Batuman said. Most bactericide treatments are not very effective at staving off citrus greening because they were not directly delivered into the citrus vascular system, where greening — and its associated bacterium, Candidatus Liberibacter asiaticus (CLas) lives, he said. The therapeutic chemicals can kill or suppress the growth of CLas and can be used in greening-affected plants, Batuman said. The system can also help newly planted trees fight greening by controlling the Asian citrus psyllid, which can transmit greening into citrus plants, he added. Researchers see the automated delivery system as part of an integrated pest management program to help stem the psyllid. “We are developing a delivery method that will send chemicals with therapeutic potential into phloem, where bacteria live,” Batuman said. This four-year project will also study citrus vascular systems with a multidisciplinary research team. Members of the team are Nabil Killiny, associate professor of plant pathology; Amit Levy, assistant professor of plant pathology; Ute Albrecht, assistant professor of horticultural sciences; Fernando Alferez, assistant professor of horticultural sciences; Yiannis Ampatzidis, assistant professor of agricultural and biological engineering and Tara Wade, assistant professor of food and resource economics — all with UF/IFAS. Also on the team are Louise Ferguson, Extension specialist with the University of California-Davis and Veronica Ancona, assistant professor of plant pathology at the Texas A&M University-Kingsville Citrus Center.